We’re going nuts for coconuts on the blog today. Absolutely bonkers. Because coconuts make me dream of living on tropical paradise. 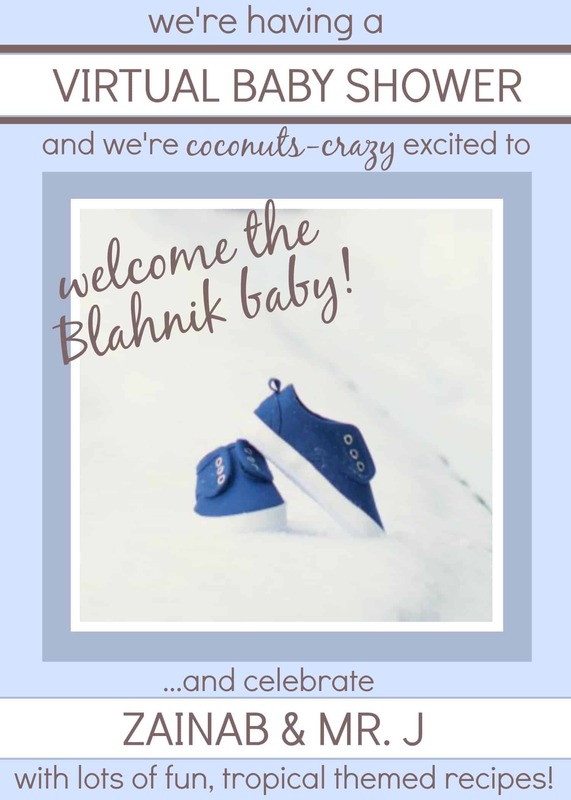 Because we’re having a baby shower for Zainab from Blahnik Baker! Many of you may know Zainab for her amazing baking. See Red, White and Blue Layered Flag Cake; Meyer Lemon Rosemary Cupcakes; Coconut Lime Bars; Chocolate Pavlova with Strawberries and Cream. But what you don’t know is that this girl has me covered for happy hour on Fridays. Every week, she tweets many delicious drink recipes that tantalize my taste buds and leave me thirsty for alcohol all Friday long. Girl knows what’s up. Zainab’s got my back for TGIF drinks, but I was at a loss when was figuring out what to contribute to her shower. My amateurish baking skills won’t fly at this party. That’s when I turned to my wheelhouse—stir fries. You may also know that Zainab LOVES coconuts, so this fried rice is just oozing with coconut flavor. We got coconut milk, coconut oil, and toasted coconut up in this business. Don’t worry though. The coconut flavors are subtle, so it won’t feel like you got hit in the face with a coconut with every bite of this rice. I assume that would hurt a lot, but that’s besides the point. I made a big batch of fried rice because this baby shower is HUGE. I’m so excited to see all the desserts that everyone is bringing to the party! It is truly a sweet celebration. What better way is there to celebrate Zainab and Mr. J’s new addition to the family? 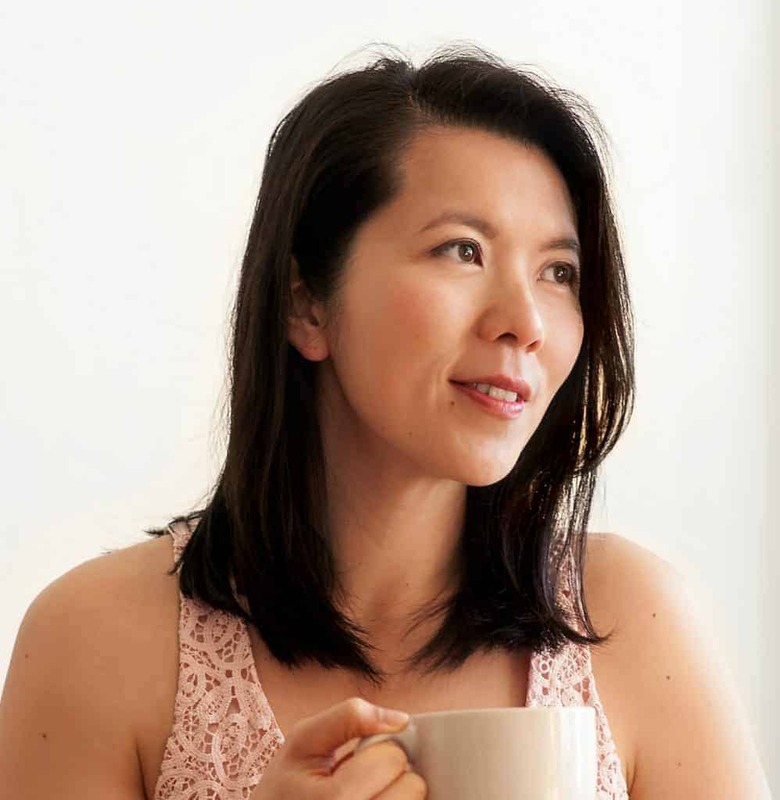 Make sure to see what the other bloggers are cooking! Cheers to you and the hubs, Zainab! A simple pineapple fried rice that is bursting with coconut flavor. 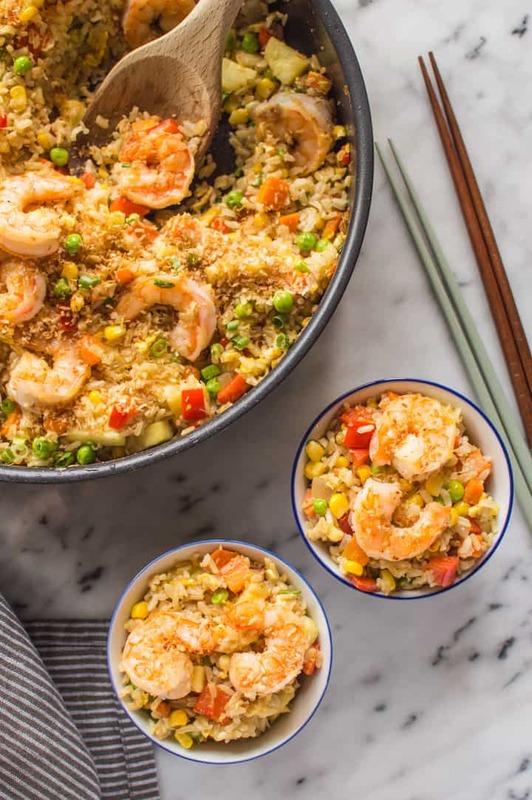 This colorful, flavorful dish is perfect for parties! Serves 6 to 8. COOK COCONUT RICE: Bring 2 cups of water to boil in a large saucepan. In the meantime, wash your rice until the water is clear when you strain it. Once water boils, add coconut milk and a pinch of salt. Add rice and bring heat to medium low. Let everything simmer until the water is nearly boiled out (you should be able to see a tiny bit of liquid at the bottom). Reduce heat to low and cover the saucepan. Continue cooking until all water has evaporated, about 4 to 5 minutes. Turn off heat and let the rice sit. COOK SHRIMP: Heat 1 1/2 tablespoons of coconut oil on a sauté pan over medium-high heat. When the oil is hot, add shrimp and cook each side for 2 to 3 minutes. The shrimp is done when you no longer see gray spots on the shrimp. Sprinkle some salt and dish the shrimp onto a plate. COOK FRIED RICE: Heat 2 1/2 tablespoons of coconut oil in a deep sauté pan over medium-high heat. When the pan is hot, add the onions and cook for 2 to 3 minutes, until onions are translucent. Add diced carrots and red pepper and a generous pinch of salt. Cook for 2 minutes, stirring constantly. Add corn and peas and cook for another 2 minutes. Pour in the eggs and add most of the green onions, saving some for garnish. Cook eggs for 1 to 2 minutes. Next, add the rice and pineapple. Keep stirring until the eggs are fully cooked. Season rice with soy sauce, sesame oil, and salt. Mix in the cooked shrimp and turn off the heat. Sprinkle remaining green onions and toasted coconut on top of the fried rice and serve. Refrigerate leftovers in an airtight container for 3 to 4 days. 1. You’ll notice that aside from my trusty friends soy sauce and sesame oil, I didn’t add too many other seasonings in the fried rice. I thought adding too many sauces would take away from the coconut flavor.[br][br]2. You can always cook the rice ahead. In fact, using day-old rice is preferred for fried rice dishes. Thanks Jocelyn, Alice, and Allie for making this baby shower happen!! What a festive meal idea for Zainab’s shower! One must balance the sweets with something savory, right? What a fabulous celebration and all the FOOD! There’s so much to choose from… I’m just going from site to site enjoying all the deliciousness… and I am a huge coconut fan too, so this list suits me just fine! Your fried rice looks so delicious, Lisa! And you used coconut milk to make your rice?! Oh, I can’t wait to whip this up! Thank you my dear! This looks wonderful! 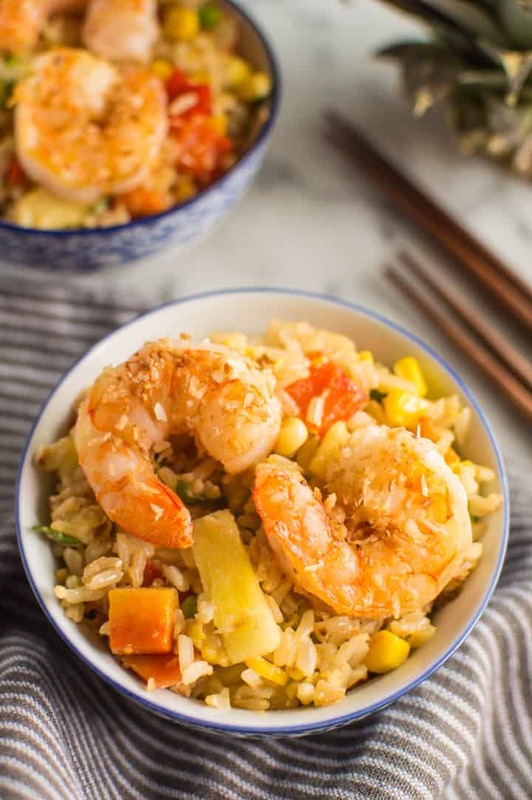 I love the tropical twist on fried rice! YAY someone brought something savory to the party! This dish looks MOUTHWATERING! 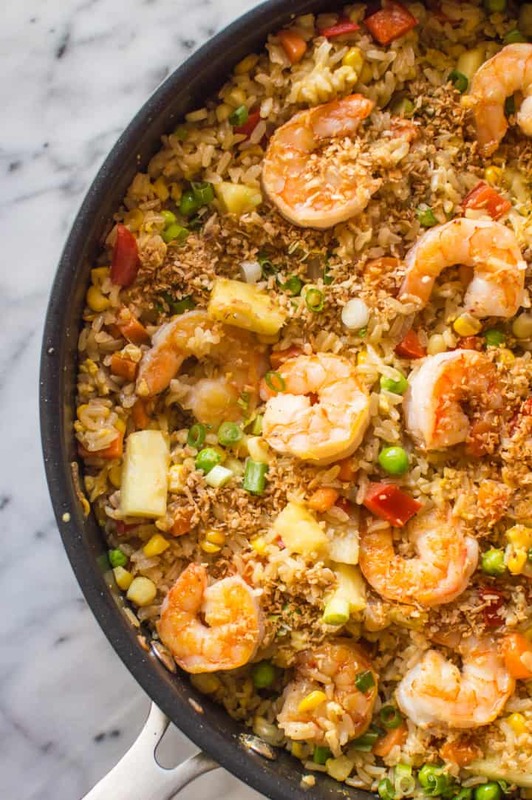 I would totally be the person at the baby shower that is hovering around the coconut pineapple fried rice, trying to hoard it all to myself. It looks soooo amazing! 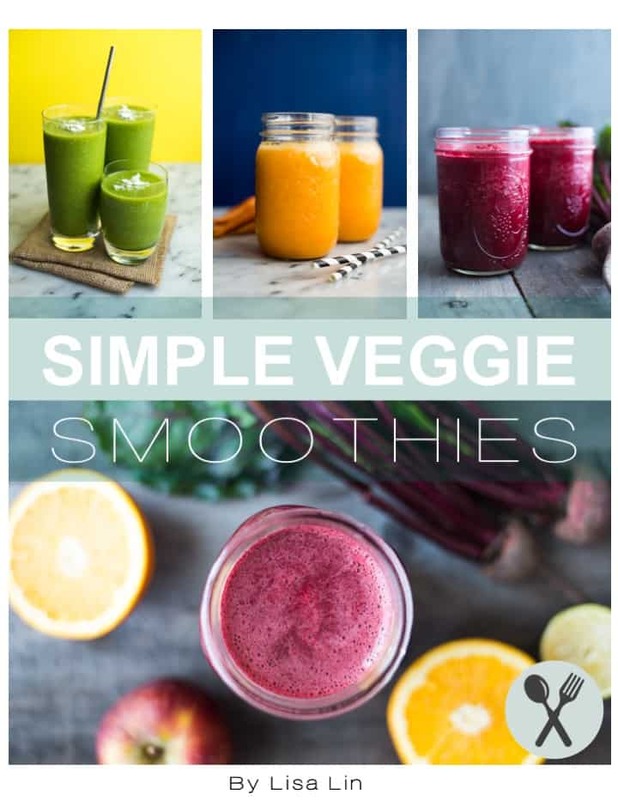 I love all the ingredients so I’m jonesing to make this at home! Oh my gosh girl you have me craving this rice for real! I’m so glad you went savory because this dish is totally the bomb. I’m such a sucker for anything with coconut milk! Thanks so much for being a part of this celebration! Oh I want to dig right into that bowl! Looks delicious! You need to teach me your awesome stir-fry ways! I’m so glad we can celebrate Zainab together today! Yeah! I love the sound of coconut and pineapple together! What a unique take on a classic! This sounds fantastic! I love making fried rice at home. Never tried it with coconut to pineapple. Will have to try adding these next time. Thanks! This is an insanely delicious looking recipe that I am totally bookmarking for future dinners! It will be a hit in my house for sure! This looks utterly amazing! I think it goes perfect for any kind of party! Oh savory use of coconut! Love it. This looks incredible! I was just telling my husband that I wanted to order pineapple fried rice for takeout this week, I’ve been craving it for weeks! Guess I have to cave and make yours instead 🙂 YUM! Lisa, I LOVE that you made fried rice!!!! this looks sooooo good! and is exactly what I would be munching on at a real baby shower! LOVE!!!! and thank you so much for joining the celebration today!!! and amateurish baking skills?! What?! But dude, yeah you got stir fry skills for sure! This looks incredible, Lisa! I love that you made fried rice! 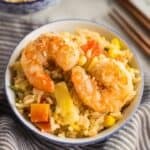 Pineapple fried rice is my favorite and I love all the coconut you added in here! This is perfect for Zainab’s shower! ooooooooooh my hubby would love this recipe! and I’m sure Zainab would too! I love this dish! Those flavors are all so awesome together, and the shrimp in there sounds delicious! We needed a savory recipe at our party, so this is just perfect! My husband and I really loved this. Just be warned- it makes a ton!! We had it for a few nights, which was just fine with us! If you have extras for additional nights, I would suggest adding some more pineapple and toast additional coconut. So good!